Please also note a correction/expansion in the Reading recovery section (12/08/200. 10:45 AM). Monday, December 7 will be a very busy evening for the Madison Metropolitan School District Board of Education. Tonight, among other things they will consider 4 year old kindergarten implementation plans and costs; Reading Recovery matters; a 3% total package increase for District Administrators; and Strategic Plan Performance Objectives and Measures, Core Performance Measures and First Priority Action Steps (with costs). Unless I am mistaken, these will be discussed in Committees tonight and then come back to the Board for action next Monday and some, like 4k even later. That’s the new system. Under state funding rules, the Madison School District would not be fully reimbursed for its 4K expenses until the third year of the program, when the district would actually reap a surplus from the state. The big problem with this framing is that the projected surplus is not in state funding but in revenue limit authority and last I checked well over 80% of MMSD’s revenue limit authority is collected via local property taxes. It makes a big difference which stack the coins come from, such a big difference that cuts in the state share induced the Madison Board and many others to not use all of their authority this year. They thought that property taxpayers couldn’t or wouldn’t stand for it. As a result, MMSD will not be doing maintenance projects that had been previously funded via a voter approved referendum. I don’t see any discussion of where the start up costs will come from (maybe I missed it), but my guess is the district’s growing Fund Balance. One thing I will say for the MMSD is that they used a conservative (and depressing) $200 per pupil annual revenue limit increase for their projections. I don’t know enough about costs to judge those projections. I’m a little skeptical of the surplus in general because almost across the board, across the state revenue limits do not keep up with cost-to-continue. I do know that we should try to move 4k forward if we can afford it and these look like viable options. 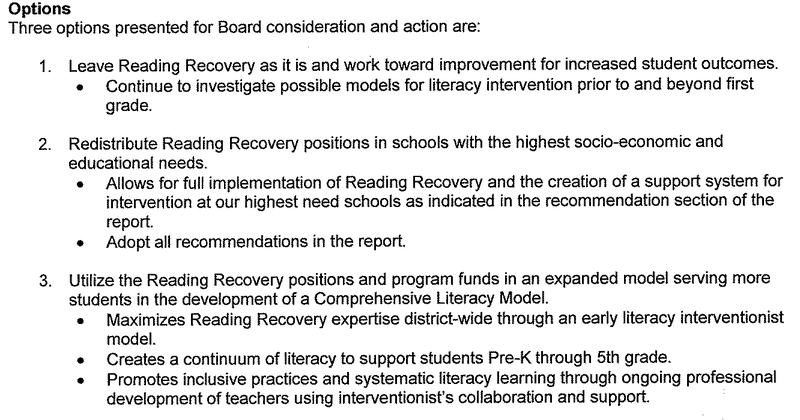 There is a long and controversial history with the Reading Recovery remediation in Madison. I’ve always been supportive of the program, but a bit skeptical of the claimed local “success” rate (if the reality was anywhere near what was being reported, then much good and even “bang for the buck” was happening). The report linked above gives some better data, a lower “success” rate and some options for the future. I’m very glad to see this level of analysis. I haven’t had the time to do more than skim, but I’m more confident of the conclusions than I was previously. With that in mind, I would tentatively support the third of the three options offered (the administration recommends the second). I especially like the pre-K to 5 continuity and the inclusion aspects. Correction/Expansion: I confess to having only skimmed when I posted earlier. Having looked closer I see I misunderstood option 3. Now that I am clearer, I support option 2. This is the one that takes the Reading Recovery that is working — full implementation with wrap around supports and followup — and puts it in the neediest schools and eliminates the partial and unsupported implementations. I would prefer to expand the version that is working, but that is not an option before the Board (I misunderstood #3 to be that option). The proposal is for 1.48% pay increase and a 3% total package increase to cover (1.52%) increased benefit costs. There is something unseemly about administrators getting a pay increase at a time when we aren’t taxing to the max, aren’t doing maintenance and will be looking at program cuts in the Spring. I know most work hard and most do a good job…but…. times is tough all over and most of these people earn in the six figure range. No cost estimate is included. There should be. My gut reaction is give them the benefit costs increase and not the salary. Times is tough. When I first read these I had some concerns about the possible lack of disaggregated reporting called for. The “Core Performance Measures” draft says “All measures related to students will be disaggregated…” but there is no similar statement for the non-performance (ie participation) measures in the big “Strategic Objectives Performance Measures” and in places specific disaggregations are identified (Special Ed for one). I was given assurance that the intent is to have all of these disaggregated and that in some manner that will be made part of the public record at the meeting. I’ve posted requests and discussed the issue on this blog, asked in public and private, as an individual and as an Equity Task Force member for disaggregated data on participation in advanced and other programs. We can’t know how we are doing on removing barriers to educational opportunities without this information. I do hope that after all these years we get it and on a regular basis. Let’s see how bad the disproportionalities are and then see how the efforts to address these are working. On a related note, I’ve been told that the required Equity Report information will be included in a broader January report. I’m glad something is happening and appreciate those on and off the Board who have pushed. I have some similar concerns with the “Core Performance Measures” and the lager (200 item) “Strategic Objectives Performance Measures.” Ideally the Core items will give the “forest” and the larger ones will be for those of us who like to get lost in the trees. There is no doubt in my mind that the items on that larger list will get very little attention from the Board…information overload. This makes it crucial that the Core list include the right things. I see a lot of use of the WKCE, probably too much. I also don’t see anything about how well we are doing changing district culture and school climate, increasing participation in anything but the ACT, direct evaluation of any Strategic Plan associated initiatives…This isn’t a whole lot different than what NCLB requires. 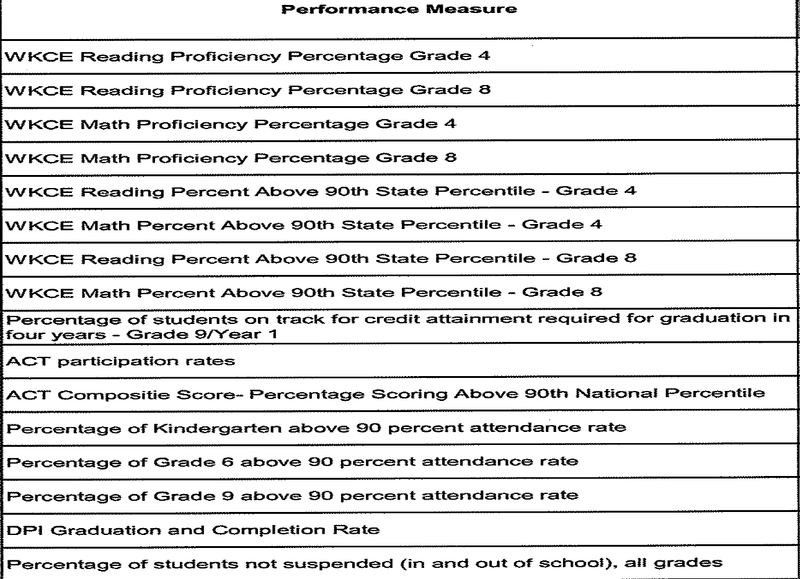 In fact some of these have the NCLB fiction of 100% proficiency as the goal. Not good. Take a look at some different things in the big list and think about what you’d like to see included. Post in comments if you want. I’d especially like to hear what members of the Strategic Plan Team. I plan to try in the next week or so…time is tight so I might not get a chance to do much. One idea is to look at the effects of the Individual Leaning Plans that will be piloted. One more thought on the big list for now and then a a little more. This one is personal. On page 11 there are three items about Community Engagement. All simply ask for number counts of community members at engagement sessions, on advisory groups… There needs to be something about the quality of the experience. Having attended too many engagement sessions and served on Task Force, I can tell you that these experiences can and do produce disengagement. This needs to be addressed, the quality needs to be improved and counting numbers of participants won’t even put the problem on the radar.